Prominent & Leading Manufacturer from Noida, we offer popcorn popper machine and popcorn popping machine. 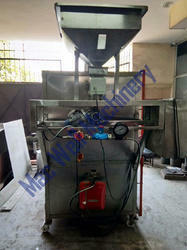 popcorn making machine/popcorn making plant/popcorn processing line/popcorn processing progress. 1. This machine line adopts the puffing American technology , it is an combination and hot air circulation. Maize Popping Machine keeps the self-owned flavors, nutrition and colors of wheat, rice, corn, millet and other cereal grains. It is the best suitable puffing machine to prepare popped crispy popcorn, pop rice, coffee corn etc and these crispy popped cereals can be used to produce rice cake, nutritional bar, energy bar or cereal bar etc. This production line adopts advanced new-type airflow puffing technology to get corn kernels puffed directly with three options of heating sources: electricity, natural gas and diesel oil. It creates hot air with high efficiency and energy saved. The puffing and caramel coating is processed in the continuous production line with temperature and speed adjusted by frequency inverter, operated and controlled by PLC. The whole line is relatively inexpensive, fully automated, easy to operate, performed stably and products are coated uniformly.